The role of social sciences in public policy processes is an increasing focus of academic and science policy debates, with regular calls for better integration of social science evidence and expertise in policy advice processes. 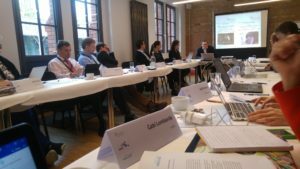 On April 25th 2017, The Stiftung Foundation, Mercator Research Institute on Global Commons and Climate Change and INGSA held a one day workshop to discuss the challenges, opportunities and guidelines for social science policy advice in Europe. The workshop generated lively, well-informed and highly inspiring discussion on challenges such as bridging social science and policy as very different systems and the reliability of social science advice. The group also considered promising ways forward for promoting social science in the policy realm and improving knowledge aggregation and the treatment of value issues. Read the full workshop report. Workshop participant Alessandro Allegra, Doctoral Candidate in Science and Technology Studies at University College London, offers his perspective as an early career researcher on the workshop here.